When one hears about Mindanaoan art, images of bold colors and shapes, varied textures, and indigenous patterns easily come to mind. In Davao alone, there are several noteworthy artists that showcase Mindanaoan pride through distinctive and dramatic art pieces that represent life, culture, history, and stories about the city. A recent art exhibit mounted by Phoenix Petroleum in Davao City showcased the talent of local artists and various representations of Mindanao. “The exhibit is a collection of excellent, diverse, and original artworks by selected intergenerational Davao-based artists. It is a showcase of emerging and established artists, who were carefully chosen and thoughtfully curated,” said Victor Secuya, Mindanaoan artist, curator, and one of the notable names in the art scene. A total of 12 artists participated at “Beginnings and Beyond,” which ran at SM Lanang Premiere in Davao City from December 8 to 16, 2017. Each of the artists contributed two paintings that exhibit Mindanao’s vibrant culture as seen through their eyes. 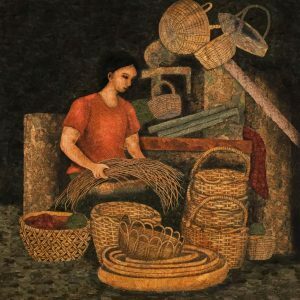 “The featured paintings are images of Davao and Mindanao filtered through the artists’ visual vocabulary, singular vision, and unique interpretation of Mindanao men, women, children, flora, and fauna,” said Secuya. The artists delved into the project with gusto, each one a professional storyteller making use of their 4×4 canvases as their medium and their chosen art materials as their pens. 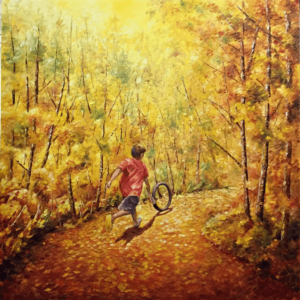 Misha Pueblas, one of the featured artists, made use of dried leaves, a non-traditional material in his art pieces to highlight the muted tones of his subjects and to give texture to the paintings. According to Misha, he paints with his heart, and he uses his life experiences in developing his masterpieces—a mark of a true Mindanaoan artist. 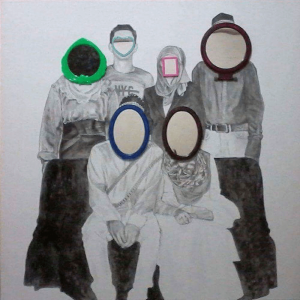 Alynnah Macla, proudly Muslim and Davaoeño, incorporated the hijab in her artworks and made use of mirrors that came in varying shapes and sizes to cover the faces of her subjects. According to her, Islam prohibits showing of the face so she masterfully conceals it through her choice of angles, the hijab, or by painting her subjects from behind. The mirrors also invite the viewers to relate to her paintings, making them feel one with her art. Dadai Joaquin, impressionist and self-taught artist, exhibited her mastery of light through her paintings “Bougainvillea” and “Kariling.” Her precise brush strokes helped define the direction of the sun as it shines upon its subjects, bringing each one to life and giving them a whole new meaning. Seasoned artist Bong Perez translated to art Mindanaoan life from his point of view as a resident and as a tourist. 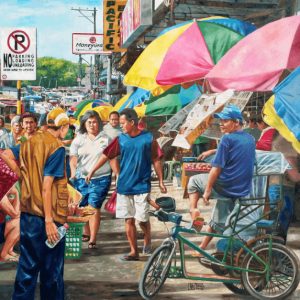 His picturesque paintings captured real-life imagery that communicates the urban and rural life of Davao City. Through his realistic representations, he was able to show to the world everyday scenes from his hometown in tasteful, full-color masterpieces. 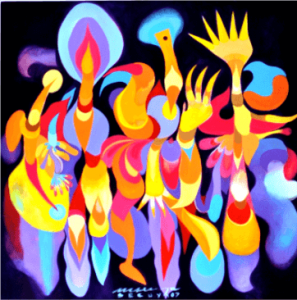 Exhibit curator and one of the featured artists, Vic Secuya, in his two-series painting, showcased his interpretation of his beloved island, Mindanao, depicting it through bright and vibrant colors and unique shapes that communicate movement and denote direction. His contributions to the exhibit, “Memories Of My Father’s Farm 1 and 2,” added a mysterious component to the lineup of artworks. Pueblas, Macla, Joaquin, Perez, and Secuya are just five of the 12 featured Mindanaoan artists who create art with their hearts—making each and every artwork a memento of their life in Davao. The intricate details of their masterpieces are a reflection of their experiences, their passion, and the stories they want to convey through their paintings, and Phoenix Petroleum has provided them the opportunity to share their talents and carefully woven stories to the world. “Mindanao is home to talented artists, and we want to provide a venue for them to share their stories about our home, through this art exhibit,” said Phoenix Petroleum President and CEO Dennis Uy, during the exhibit opening. The event was part of the company’s celebration of their 15th founding anniversary and 10th listing anniversary, being a company that started in Davao City and now a national brand. The 12 featured artists were Venerando “Rey” Bollozos, Adolfo Buenaventura, Mariano “Anoy” Catague, Rogelito “Jun” Cayas, Amanda Echevarria, Louella “Dadai” Joaquin, Alynnah Macla, Gilbert Miraflor, Welehito “Lito” Pepito, Teody “Bong” Perez, Mishael “Misha” Pueblas, and Victor Secuya.